Forestry rangers are now combing the Nam Nao national park hunting for poachers after a bull elephant was killed and its tusks gouged out from the dying elephant. The brutal killing pattern of the elephant by the poachers was revealed by the head of the Nakhon Ratchasima-based Conservation Office 7 Mr Thakorn Lomstaporn yesterday. He said he was alerted by a foot patrol team of forestry rangers in Papung wildlife sanctuary that found a killed bull elephant while on a foot patrol from Phukok forest in Nam Nao National Park to Chulabhon Dam. The team said as it arrived at Huey Pong forest in Pa Pung wildlife sanctuary, a dead bull elephant was found lying with its right side on the ground. A close examination of the decomposed body showed it was shot by an unknown calibre of gun on the left ear, and another shot 20 centimetres from the first below the left ear. The poachers chopped off its trunk and placed it three metres from the body. The front head of the elephant was cut off, indicating that the poachers gouged out the skull of the elephant in order to remove the tusks which is a brutal way of killing the dying elephant. The elephant was believed to be killed a week ago and was in bad decomposed condition, the team told him, he said. The team also sought permission from local police to burn the carcass as it was emitting a disgusting smell, and it was far away from communities, he said. 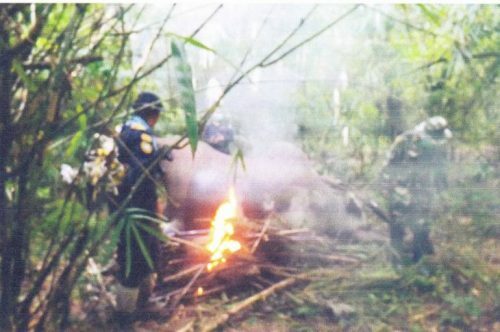 He also stated that forestry rangers are checking closed circuit CCTV footages at the entrance of the Nam Nao National Park looking for clues of suspects during the past week and will begin combing the scene and adjacent areas for other evidence to hunt down this group of poachers for court trial.